The Rock of Dunamase, or Dún Masc in Irish meaning ‘the fort of the Masc’, in Co. Laois, is one of the most historic sites in Ireland. Its ruins date back many hundreds of years. The Rock rises 150 feet off the ground in the middle of what is otherwise a flat plain. The Rock of Dunamase was an ideal defensive position with its view right up to the Slieve Bloom Mountains. The Rock was first settled in the 9th century when a fort or dun was constructed on the site. 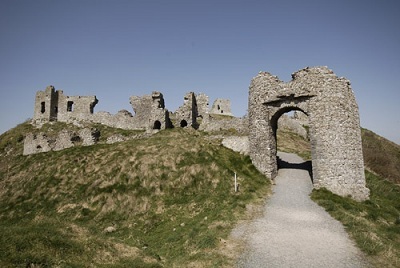 Although the Rock is said to be drawn on a map by the Greek cartographer Ptolemy under the name ‘Dunumm’ in the 2nd century, there is no archaeological evidence to support the theory that Dunum is Dunamase. Dunamase started as an early Christian dun known as Dun Masc ‘the Fort of Masc’. The earliest historical reference to Dunamase is in the annals of the four masters where it states that Dun Masc was plundered by the Vikings in 843AD and the abbot of Terryglass was killed. The castle was built in the second half of the 12th century. With the marriage of Strongbow’s daughter and heir, Isabel, the castle passed into the hands of the marshal family. William Marshal, who later became regent of England in the minority of Henry III, had five sons, all of whom succeeded him in turn and died without issue. So in 1247 the Marshal lands were divided among William’s five daughters. Dunamase fell to Eve Marshal and then to her daughter, Maud, who was married to Roger Mortimer. The castle remained in Mortimer hands until 1330 when another Roger Mortimer was executed for treason. By the time the Mortimer family was rehabilitated the castle seems to have passed out of the area under Norman control. In the latter half of the 18th century Sir John Parnell started to build a banqueting hall within the ruins and this work incorporated medieval architectural details taken from other sites in the area. The Rock of Dunamase is located in Laois; the site is a short distance from the N80 road, between the towns of Portlaoise and Stradbally. Portlaoise is the county town of Laois; it is a major commercial, retail, and arts hub for the Midlands. Portlaoise is bypassed by the M7 motorway which connects Dublin and Limerick, with access to Cork. The train station in Portlaoise provides an intercity service between Dublin and Cork, and also provides a commuter service to Dublin. Bus Eireann operates an expressway service between Dublin and Cork which calls at Portlaoise, whilst Aircoach offer a similar service that also calls at Dublin Airport. Portlaoise is the first stop on the bus service Dublin Bus. It is also the last stop when coming from Dublin. Stradbally is a small town located about 12 km (7.5 miles) from Portlaoise. The town acts as a service centre for the surrounding agricultural hinterland. There are a wide range of services in the town including doctors, beauticians, hairdressers, public houses, garages and small shops. Stradbally is famous for its Steam Rally, an annual gathering of enthusiasts of steam-powered vehicles, held in the grounds of the Cosby estate at Stradbally Hall.